The Lakeland Sinfonia is the Society’s own orchestra, comprising musicians from across the north-west of England. They are principally peripatetic instrument teachers, plus retired or semi-retired professional orchestra players. The orchestra, managed by Peter Crompton (who is also the Librarian), plays two of the eight concerts each season, with a highly acclaimed professional leader and an internationally renowned conductor. A top-class international soloist plays a concerto with the orchestra; this season we welcomed Sam Haywood on 26th Sept and welcome Alessandro Taverna on 6th Feb 16. 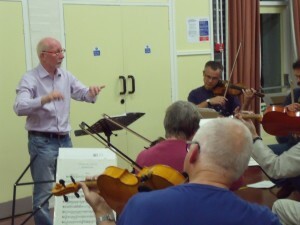 Here the orchestra is rehearsing with Wyn Davies (Conductor) and David Routledge (Guest Leader) for its September concert.